Did You Know About the Island Paradise of Niagara Falls? When you think of the islands near Niagara Falls, most likely your first thought is of Goat Island, the small island located between Bridal Veil and Horseshoe Falls. However, there is another island paradise in the Niagara River, one that offers plenty of scenic beauty and a chance to escape from the hustle and bustle of the city. 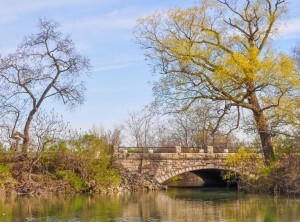 The Dufferin Islands are a group of manmade islands located about 2 kilometers from Horseshoe Falls in the Niagara River. Here the river waters flow more slowly and gently than in the rapids leading up to the falls, creating a more serene and relaxing environment for enjoying the natural beauty of the area. If you’ll be spending some time around Niagara Falls, you wouldn’t be wasting your time exploring this fascinating area. The Dufferin Islands were the once the site of one of the Niagara Falls area’s first tourist attractions. Near the islands, back in the 1820s, a natural spring released a flammable gas. A local businessman found a way to cap the spring, and then release the gas and ignite it for paying tourists. The Burning Spring drew visitors for several decades, until work to improve the Ontario Power Company changed the shape of the islands forever. Today, after nearly 100 years, the Dufferin Islands are a natural, forested 10-acre park, with well-maintained walking trails throughout. Small footbridges and suspension bridges connect the small islands of the park. 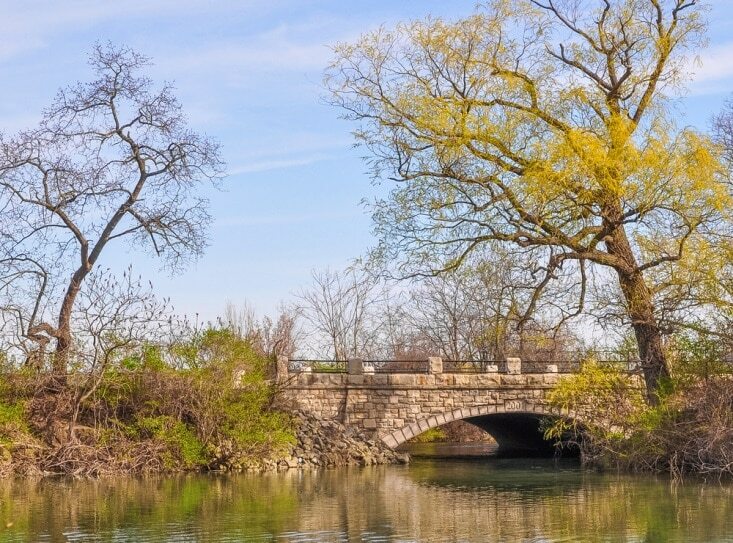 While you could easily spend a few hours exploring the paths and enjoying a picnic or barbecue in one of the open fields or in the shade of a tree, there is much more to do on the Dufferin Islands. 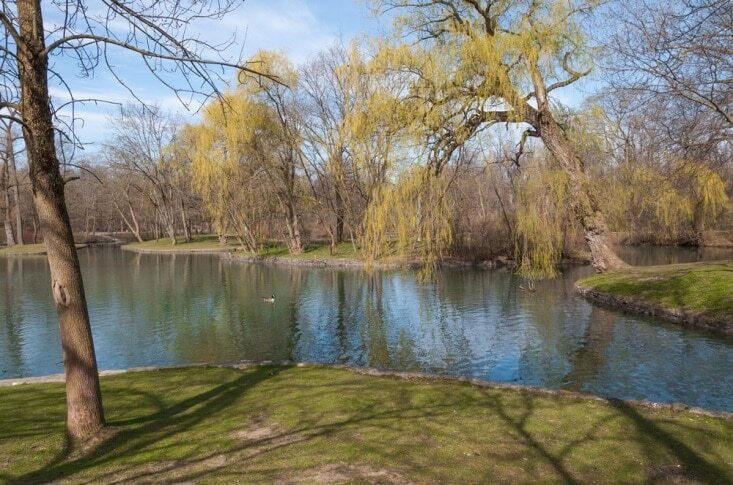 If you’re interested in bird watching or fishing, then the Dufferin Islands is the place to visit. Over the past decade, there has been a great effort toward naturalizing the area. Toward that effort, the parks commission has introduced fish to the waters surrounding the islands and created a catch-and-release fishing program that allows visitors to drop a line in the park. In addition, throughout the park you’ll find bird feeders and bird boxes designed to attract a wide variety of bird species. One of the most popular features of the Dufferin Islands had nothing to do with fish and fowl, though. Each year, from November through January, the islands form the backdrop for the Niagara Falls Winter Festival of Lights. For this favorite tradition of visitors and locals alike, the island is dotted with a number of animated light displays. While the displays do close some of the park for a time, the islands do remain open throughout the winter. One of the major reasons that the Dufferin Islands are so popular with locals and visitors alike is the fact that it’s completely free. All you need are some comfortable walking shoes, a picnic lunch and maybe a fishing pole and you have everything you need to join the millions of other visitors to Niagara Falls who have discovered the wonder of this unspoiled island paradise.